Author(s): Xiaoming Liu, Qi Fu, Yong Du, Yinxue Yang, Department of Colorectal Surgery, the General Hospital of Ningxia Medical University, Yinchuan 750004, China. William C. Cho. Department of Clinical Oncology, Queen Elizabeth Hospital, Hong Kong. Colorectal cancer (CRC) is one of the most common cancers worldwide. The development of resistance to anti-cancer treatment is one of the major challenges in the treatment of CRC, which limits the efficacy of both conventional and targeted therapies in clinical settings. Understanding the mechanisms underpinning resistances is therefore critical in developing novel agents to reverse drug resistance and for more specific targeted treatments. Accumulating studies have reported that microRNAs (miRNAs) are key players in the regulation of cancer cells with intrinsic/acquired drug resistance through varied mechanisms that endow cells with a drug-resistant phenotype. 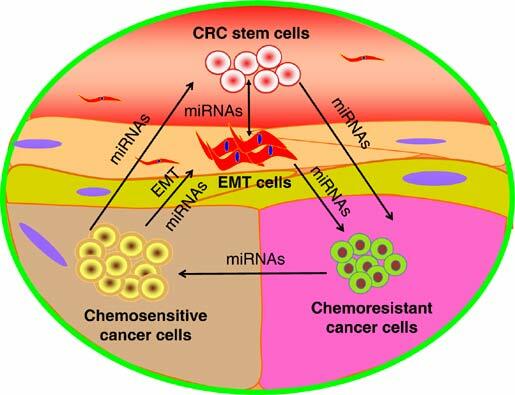 miRNAs have been evolved in the regulation of chemoresistance to various CRC treatments and the stemness of CRC stem cells (CRSCs), sequentially modulating the sensitivity of CRC cells to anti-cancer treatments. Targeting miRNAs may be a novel strategy for eradicating CRSCs, re-sensitizing drug-resistant cells to anti-cancer agents, improving drug efficiency and developing novel biological agents for CRC treatment. This paper highlights the role of miRNAs in the regulation of chemoresistance and CRSCs in CRC, with focus on the mechanisms underlying how miRNAs alter CRSCs fate, and the process of epithelial-to-mesenchymal transition, cell cycle and apoptosis in CRC cells. Keywords: Cancer stem cells, chemoresistance, colorectal cancer, microRNA, targeted therapy. Affiliation:Department of Colorectal Surgery, the General Hospital of Ningxia Medical University, Yinchuan 750004, China., Department of Clinical Oncology, Queen Elizabeth Hospital, Hong Kong. Keywords:Cancer stem cells, chemoresistance, colorectal cancer, microRNA, targeted therapy. Abstract:Colorectal cancer (CRC) is one of the most common cancers worldwide. The development of resistance to anti-cancer treatment is one of the major challenges in the treatment of CRC, which limits the efficacy of both conventional and targeted therapies in clinical settings. Understanding the mechanisms underpinning resistances is therefore critical in developing novel agents to reverse drug resistance and for more specific targeted treatments. Accumulating studies have reported that microRNAs (miRNAs) are key players in the regulation of cancer cells with intrinsic/acquired drug resistance through varied mechanisms that endow cells with a drug-resistant phenotype. miRNAs have been evolved in the regulation of chemoresistance to various CRC treatments and the stemness of CRC stem cells (CRSCs), sequentially modulating the sensitivity of CRC cells to anti-cancer treatments. Targeting miRNAs may be a novel strategy for eradicating CRSCs, re-sensitizing drug-resistant cells to anti-cancer agents, improving drug efficiency and developing novel biological agents for CRC treatment. This paper highlights the role of miRNAs in the regulation of chemoresistance and CRSCs in CRC, with focus on the mechanisms underlying how miRNAs alter CRSCs fate, and the process of epithelial-to-mesenchymal transition, cell cycle and apoptosis in CRC cells. Chemotherapeutic Options for Colorectal Cancer Patients with Cardiovascular Diseases.